Best Hot Dog | Costco (38.48%) | Food, Etc. 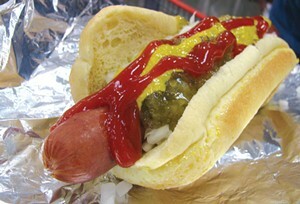 The lurid draw of the Costco dog. OK, you can't argue with the value. At $1.50 with a soft drink, the hefty hot dog or Polish at Costco (girth is important, too) is the deal to end all processed meat deals. And it's pretty good — a salty, juicy dog with the zippy tang of nitrates. But unlike, say, an organic Humboldt Hot Dog (only one vote behind! ), or a snappy Arcata Ballpark dog, there is no sunshine, no crack of the bat with which to enjoy it. No, you will pump on mustard, grind out some chopped onion from the dispenser and sit at the plastic picnic tables — cruelly reminiscent of amusement parks — and eat your dog under Costco's fluorescent lights, in the shadow of shrink-wrapped pallets of camping equipment, with passing shoppers regarding you: hunched over the crumpled foil wrapper of Humboldt's favorite hot dog.